The University of Alabama at Birmingham (UAB) encourages student innovation and entrepreneurship through multiple avenues. This includes: general courses that promote the concepts and ideas of I&E, Speaker Series, newsletters, university-wide conferences about the importance of I&E. In addition to this, there is also an entrepreneurship minor, certification programs, student organizations, and campus-wide competitions that allow students to become more involved in the campus ecosystem and put I&E concepts into action. Students also have the option of going to collaborative spaces such as the Makerspace, Edge of Chaos, or the Project Lab to develop their ideas and build prototypes. In addition to having many resources internally, UAB students and faculty also have access to many external resources. UAB actively encourages faculty to develop their entrepreneurial pursuits by linking them directly to opportunities to commercialize their ideas: whether they are centered around their own biomedical research conducted in their labs and funded through the NIH, or independent, solution driven ideas that need external funding from local investors in order to reach their full potential. Faculty have the option of applying for seed funding from UAB’s Institutional Funding pool, which is comprised of donations from more than 25 of Birmingham’s local businesses and VCs. Because of UAB’s close proximity to the Economic Development Partnership of Alabama (the EDPA), Faculty are able to easily access the resources necessary for them to apply for i6 grants - funds set aside solely to translate ideas and inventions into products, services, companies, and jobs. Academic researchers and private investigators are also encourage to participate in I-Corps, a three week program designed to help faculty explore and evaluate the market potential for their research. Along with access to mentorship from industry veterans, participants in I-Corps are able to become integrated within the general downtown Birmingham business scene through various networking opportunities and mixers, gain knowledge of the business model canvas through one on one training sessions, a chance for up to $2,500 in funding directly from UAB’s division of the program, and the opportunity to apply for the NSF National I-Corps program $50,000 grant award. UAB also boasts non-aggressive Intellectual Property rules, encouraging UAB faculty, employees, and students to discuss scientific discoveries and possible inventions with their patent office as early in the research as is possible in order to navigate important issues such as commercial potential, intellectual property rights, and the timing of public disclosures. Patents can be directly filed through the University, and if the legal fees are covered by UAB, they may be entitled to royalties and a possibly partial or total ownership/equity of the innovation in question if applicable. Disclosure of discoveries and inventions which appear to have commercial value are made to the UAB Institution for Innovation and Entrepreneurship. According the Board’s Rule 509, all faculty members, university employees, and students, as a condition of their employment and/or enrollment, are required report all inventions and discoveries that were made while they were employed or enrolled as a student at UAB in order to make IP disputes and filing as seamless as possible. In order to make navigating the technology transfer function as easy for campus innovators as possible, UAB has established four offices that handle issues related to filing patents and topics relating to intellectual property - the CIRB, HIIE, OSP, and OIE. One of the advantages UAB has for making I&E impact is its location: Birmingham, the most-populated city in Alabama. The university partakes in an array of partnerships with different industries and businesses throughout the city. One of UAB’s most notable university-industry collaborations is iLab, which is the Collat School of Business’s collaboration with Birmingham’s Innovation Depot. The UAB Innovation Lab (iLab) provides students with hands-on-experience and an opportunity to engage with the Birmingham entrepreneurship community. Additionally, iLab supports students with mentors to help them develop their ideas. Regional funding is also available for aspiring entrepreneurs through EDA, Alabama Launchpad, i6 Grant, and BVC Spark Match. Overall, UAB is a powerhouse for academic, clinical and research innovation that positively contributes to the city of Birmingham, the state of Alabama, the nation and the world. According to the 2015 NSF Report on Higher Education Research and Development Survey, UAB ranks in the top 25 federally financed public research universities. In addition to this, UAB is the largest single employer in the state of Alabama and generates significant impacts for its employees and the state in terms of economic, employment and government revenue impacts on a daily basis. The university itself, the UAB Health System, and Southern Research drive a significant amount of the Alabama economy every year. The UAB community includes more than 19,500 students, 23,000 full-time and part-time employees, and 120,000 active alumni worldwide. With its academic rigor, health care presence, robust research activity, and economic activity, UAB is an excellent university that cultivates innovation and entrepreneurship. The UAB Innovation Lab (iLab) is a partnership between the UAB CSOB and Innovation Depot; it serves as a conduit between students and the entrepreneurial community. iLab opened its doors in Summer 2014 and serves as a resource for students interested in entrepreneurship and innovation. The Lean Startup Model is used as the iLab common language. Programming offered by the iLab provides students with the hands-on learning needed for success in the workplace and is designed to support students as they incubate and accelerate their startups. This experiential program is designed for students in any major other than business. It is designed to complement your core skills and knowledge from your chosen major. Upon completion you’ll be ready to launch a new venture around your passion, contribute to a team or growing company and think entrepreneurially regardless of your chosen career. Each session will include demonstrations of Sterne Library databases, print materials, and reputable web sites as well as effective search strategies and tips. You will also have the chance for hands-on research practice each week and multiple chances to win Sterne Library travel mugs. The graduate level Entrepreneurship Certificate, also known as the Graduate Certificate in Technology Commercialization and Entrepreneurship, is designed to expose students (MBA and non-MBA) and scientists to the business foundations of entrepreneurship and technology commercialization. The program is designed to blend knowledge and experiential learning to help move scientific discovery and inventions out of the lab and into the marketplace. The intended sequence of the courses takes the student from general awareness of issues associated with technology commercialization to running a growing technology-based business. It is possible for a student to progress their own intellectual property through the course sequence. However, the courses may be taken in any sequence. Alabama Launchpad promotes and rewards high-growth, innovative startups from across Alabama. The program is for new, innovative ventures in the seed or early-growth stages, or for existing businesses moving into a new high-growth market. Participants have unique opportunities to access sound business advice and critical startup capital. Alabama Launchpad gives early-stage start-ups momentum to take an idea from concept to reality. The proof of commercial relevance competition is for startups that need additional proof-of-concept work. Startups will compete for multiple proof-of-concept grants. Individual awards based on budgets submitted. REV Birmingham (REV) revitalizes places and energizes business to create vibrancy in the City of Birmingham. REV is an economic development organization that stimulates business growth and improves quality of life in Birmingham’s City Center and its Neighborhood Commercial Centers. REV fuels commercial vitality through proactive business recruitment and retention activities, and by encouraging private and public investments that support economic growth citywide. REV’s initiatives generate positive results for partners, enhance tax revenue, generate and sustain jobs, increase tourism and positively influence perceptions about the City of Birmingham. REV is a private-public partnership that was formed in 2012 by the strategic merger of Operation New Birmingham and Main Street Birmingham. CO.STARTERS is a platform to help communities grow local business. Every week for ten weeks, this facilitator-led program helps you examine your assumptions and test whether your beliefs about your business are right. As in our BIZ 1.0 Series, CO.STARTERS applies the lean business modeling methods popular among high-growth startups to businesses of all kinds. The concepts are more common to the high-growth technology community, but we see great value in this program for any creative business venture and it’s a different model than anything currently offered locally. BHAM FEAST (Funding Emerging Art with Sustainable Tactics) is a public micro-granting supper during which diners vote to democratically fund projects that use design as a transformative tool to better our community. The grant amount to be awarded at the 2015 dinner is $2,500 plus the proceeds from ticket and bar sales at the event (estimated to be an additional $2,000). Unlike conventional grant programs, Bham FEAST brings people together for conversation centered on design and innovation. This will be Birmingham’s second FEAST, in conjunction with Design Week Birmingham. The Education Scrimmage is a full-day, immersive event that will bring together those who care about making a positive impact in the community, teach them a new set of skills (design-thinking and rapid-prototyping), and then immediately apply them to real challenges being faced in the education sector. At the end of The Education Scrimmage, real education-focused organizations will walk away with a prototyped solution to their most pressing challenges, you will have a new skillset that you can apply elsewhere, and you will have connected with others who want to make our city better. The UAB Bill L. Harbert Institute for Innovation and Entrepreneurship (HIIE) strives to be a first-in-class institution created to serve as the nexus for UAB innovation, entrepreneurial educational models, applied research, management of intellectual property and the entry point for industries seeking to collaborate with UAB, our world-class university. The Harbert Institute&nbsp;online. The new Commercialization Accelerator will be a key component of the university’s plan to attract innovators within the university, help them refine and develop their ideas and connect them to the city’s larger innovation ecosystem to grow and mature. Headed by Max Polec, the Commercialization Accelerator will host meet-ups, design sprints, pitch competitions, and a wide range of student and community resources focused around innovation and entrepreneurship. Innohack is a competition that challenges participants to form innovative solutions to the biggest health care crises facing Alabama. Students and community members converge to form interdisciplinary teams from various backgrounds. Doctors, teachers, politicians, engineers, and members from every profession under the sun are represented in the competition. Think you're smarter than the rest? Think you're better than the best? Then put your mind to the test. Coming in at #21 in total funding from the National Institutes of Health (NIH) among all universities, UAB has a substantial amount of resources (nearly $220 million from the NIH alone) for faculty to pursue innovation in a research context. Faculty are encouraged to pursue ideas and are frequently recognized for their innovative work both on-campus, by campus-wide publications such as UAB Magazine and the Reporter, and off, by news features at the local, regional, and national levels. 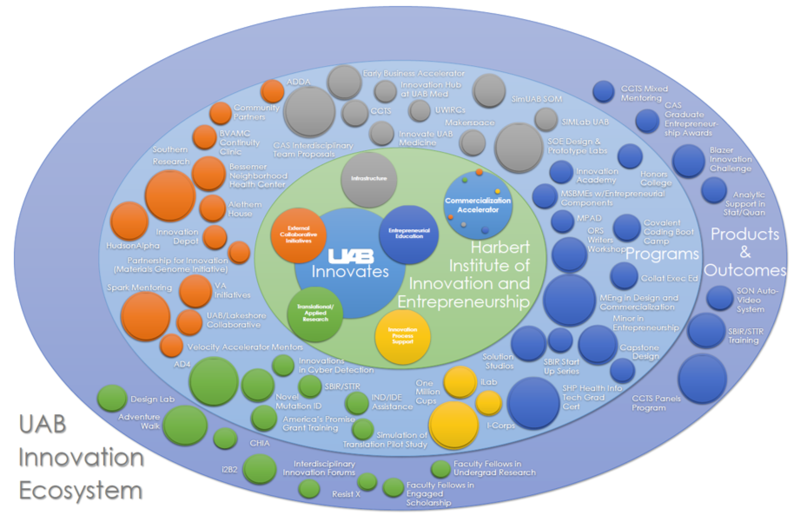 With Birmingham’s entrepreneurial landscape exploding, UAB has recently begun developing partnerships with leaders in the entrepreneurial community, as evidenced by the collaboration between the Innovation Depot (a local startup incubator) and the Collat School of Business to form the iLab, a student business incubator. These partnerships provide opportunities for both students and faculty to gain the tools needed to potentially launch their products into the market. But herein lies the metaphorical albatross around our neck—the intellectual property (IP) rights of students and faculty, not just at UAB but across the entire University of Alabama system, are non-existent. Quoted from the University of Alabama System’s Office of Technology Transfer (OTT), “When University support makes the research effort possible or when it provides support for the development of a patentable invention, it is reasonable for the University to participate in the fruits of such development, including reimbursement for its costs.” IP rights reform is needed to ensure that both our students and faculty are encouraged to innovate and disseminate their innovations into market at large. This page was last modified on 18 October 2018, at 06:27.